Tim Hockey, to become CEO in September, is the head of TD Bank Groups Canadian banking and wealth management business. 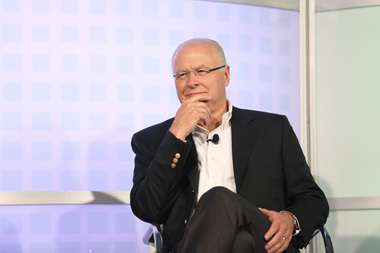 CEO Fred Tomczyk of TD Ameritrade plans to retire in September. TD Ameritrade (AMTD) said early Tuesday that President & CEO Fred Tomczyk plans to retire in September 2016. The company’s board tapped TD Canada Trust President & CEO Tim Hockey to become TD Ameritrade president in January and CEO in September; Hockey also currently heads TD Bank Group’s Canadian banking and wealth management business. Tomczyk, 60, has been CEO since 2008. He joined the company as a board member following its purchase of TD Waterhouse USA in January 2006 and was named chief operating officer in 2007. “Throughout his tenure Fred has guided our company through challenging economic times that were far beyond the control of any CEO. And yet, he had the foresight to push ahead – to invest in future growth and to take market share,” said TD Ameritrade Chairman Joe Moglia, in a statement. Hockey’s primary responsibilities today include leadership of TD Canada Trust, which encompasses Canadian personal banking, business banking and auto finance, as well as oversight of TD’s global wealth management division, which includes the bank’s direct investing, advisory and Canadian asset management businesses. Hockey recently has been in charge of strategy and operations for the firm’s Canadian business, which has annual revenues of about Canadian $13 billion, Moglia says. Hockey, 52, is an executive member and former chairman of the Canadian Bankers Association. In October, TD Ameritrade had an average of 437,000 client trades per day, down 12% from October 2014 and a drop of 2% from September 2015. The firm had $703.4 billion in total client assets as of Oct. 31, an increase of 6% from last year and a jump of 5% from the prior month. Average fee-based balances total $157.1 billion, up 7% year over year and 3% from last month. In the quarter ended Sept. 30, TD Ameritrade had net income of $216 million, or $0.40 per share, up 5% year over year. Net revenues also grew 5% to $831 million; 55% of sales are asset based, according to the firm. Net new client assets were $16.2 billion in the recent quarter, representing an annualized growth rate of 9%. Average client trades per day were about 479,000, up from roughly 434,000 in the year-ago quarter. The company does not break out its separate business results, such as those for Amerivest, its online retail advice platform, and AdvisorDirect, its service that refers clients to RIAs, in its financial statements. — Check out TD Ameritrade Meets Q3 Earnings Expectations, Boosts Sales on ThinkAdvisor.